The Catalog of the Scorpions of the World (1758-1998) was the first publication in 100 years trying to list all scorpion taxa in the world when it was published in 2000. Since then, a lot of changes and new updates have been published, but this book is still an essential source for all researchers working on scorpion taxonomy. 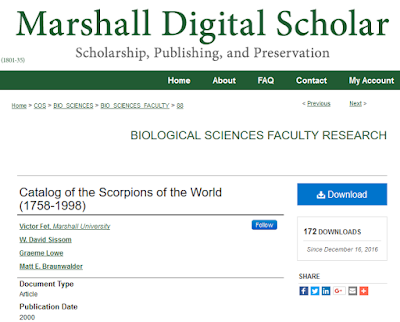 I recently learned that the Catalog of the Scorpions of the World (1758-1998) is now freely available in full text for all in Marshall Digital Scholar. This is great news for the scorpion community. Due to the size of the book, each chapter can be downloaded separately. Fet, Victor, W. David Sissom, Graeme Lowe, and Matt E. Braunwalder.
. New York Entomological Society, 2000.